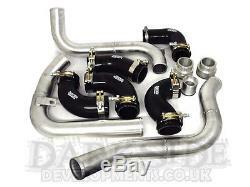 Darkside Front Mounted Intercooler Hard Pipework Kit. Fits ALL VW Golf Mk4, Bora, Seat Leon Models with the ARL PD150 Engine. This Intercooler Pipework Kit is for use with the standard Front Mounted intercooler on the 1.9 TDI ARL PD150 Engines or the S3 Intercooler modified to fit. The Alloy Pipe Kit eliminates the problematic clip connectors. There are a number of different options available with this kit, dependent on your Turbo and EGR setup. Dependant of the options selected, this kit consists of. Darkside Developments Alloy Pipe Kit with MAP Sensor Boss. Darkside Developments Clip Connector Adapters. Viton O-Ring Seals on Clip Connector Adapters. When using the standard Turbo, you will need to use the Turbo Clip Adapter. If you have retained your EGR Valve, you will require the EGR Clip which is included with this Kit. Included in this kit are 2 Darkside Intercooler Clip Adapters for use with the Standard Intercooler. Unlike other kits on the market, this does not require the use of any original boost pipes, hence the slightly higher price. All the silicones included in the kit may require slight Trimming to suit your set up, These are left long to take in to consideration tolerances between cars. The item "Darkside Uprated FMIC Hard Pipework Kit for 1.9 TDi 8v ARL PD150 Golf MK4 / Bora" is in sale since Friday, July 05, 2013. This item is in the category "Vehicle Parts & Accessories\Car Parts\Turbos & Superchargers\Intercoolers & Parts". The seller is "darksidedevelopments" and is located in Barnsley. This item can be shipped worldwide.